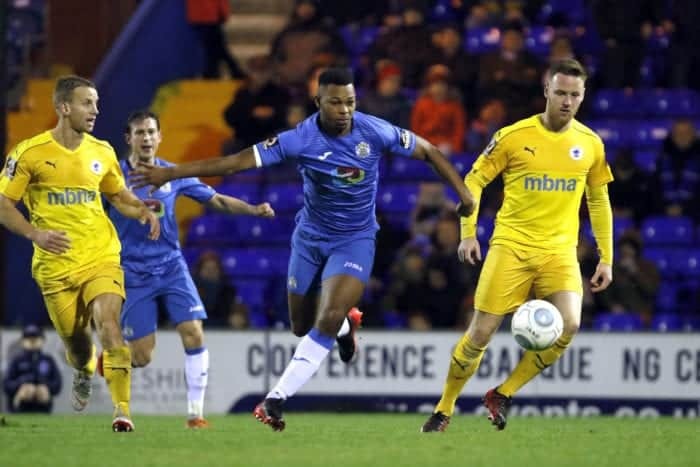 The Hatters returned to National League North action for the first time in 18 days, and shared the points on a second successive occasion in SK3 – courtesy, this time, of a Sam Walker penalty. 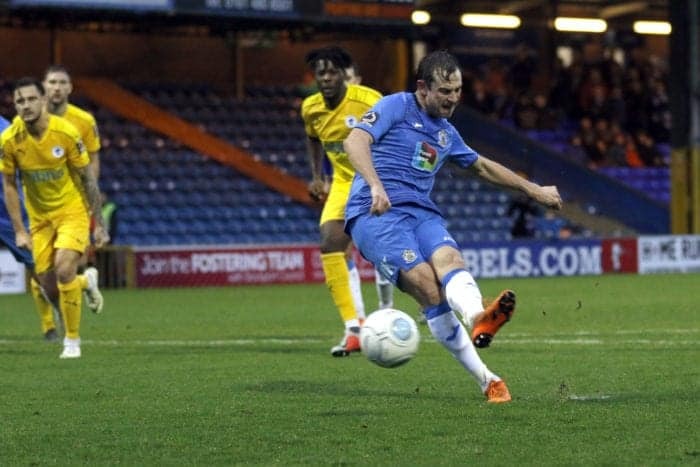 Walker’s third successful conversion for County from 12 yards came immediately before the break, to cancel out the contest’s opener at Edgeley Park – scored by the visiting ‘Blues’/‘Seals’ from Chester just after the half-hour mark. The Hatters took to the field for their first league match against a club from the Cestrian city in over a decade, showing two changes from the FA Cup starting line-up at Barnet six days earlier. Scott Duxbury returned from suspension and Matty Warburton was recalled to form part of a 4-2-3-1 formation, in place of Dan Cowan and Darren Stephenson who dropped to the bench. 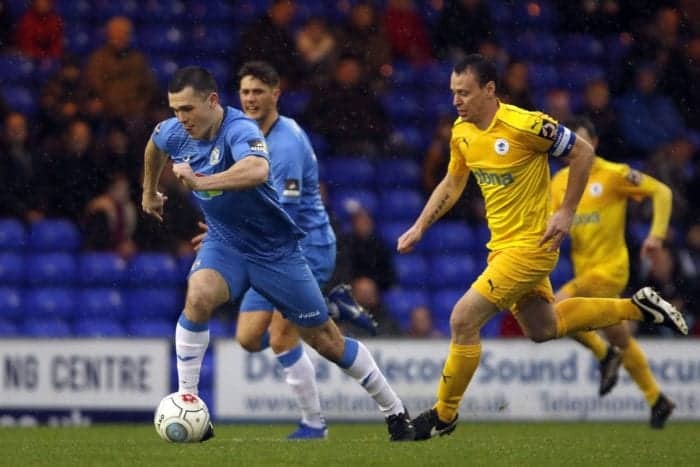 Rain was falling and the floodlights were already on four minutes into the game, when County broke to create the first chance – with Warburton drilling just wide of the right post from an angle. But the visiting Cheshire compatriots went closer after eight minutes, after Adam Dawson broke into the home area and teed up Akwasi Asante who swivelled and fired against the left upright. High-octane, end-to-end fare continued, as Frank Mulhern’s shot from the edge of the box was picked up by visiting goalkeeper Grant Shenton, before Ben Hinchliffe used his feet to clear away from Anthony Dudley and just one hand to intercept a subsequent Dawson cross from the right. 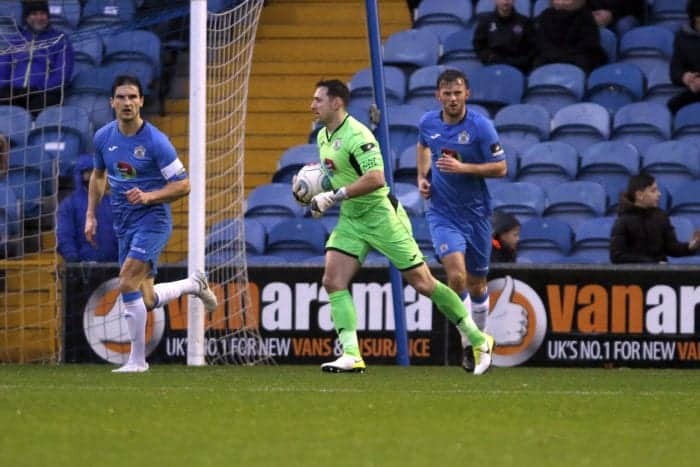 With 26 minutes played, a slip by newly-introduced substitute Deane Smalley – on for the injured Danny Livesey – let in Mulhern, who squared to Warburton. But the latter, with only Shenton to beat, struck the right post from 10 yards out. Either side of the half-hour, the visitors earned their first two corners of the afternoon – and from the second, after 32 minutes, they took the lead. Dawson’s in-swinging delivery was whipped in from the left, over Hinchliffe and to the far post where Asante volleyed home from close range. With a couple of first-half minutes remaining, Referee Adam Herczeg looked to have denied County a significant advantage when he called back play to award the Hatters a free-kick, while Duxbury had entered the home area in full flight. But, as it happened, this decision was indirectly to lead to the equaliser, with Duxbury’s looped dead-ball delivery into the box being handled by Smalley. Herczeg pointed without hesitation to the spot and, with 45 minutes on the clock, Walker slotted his kick into the bottom-left corner. HALF-TIME: County 1 (Walker (penalty), 45), Chester 1 (Asante, 32). 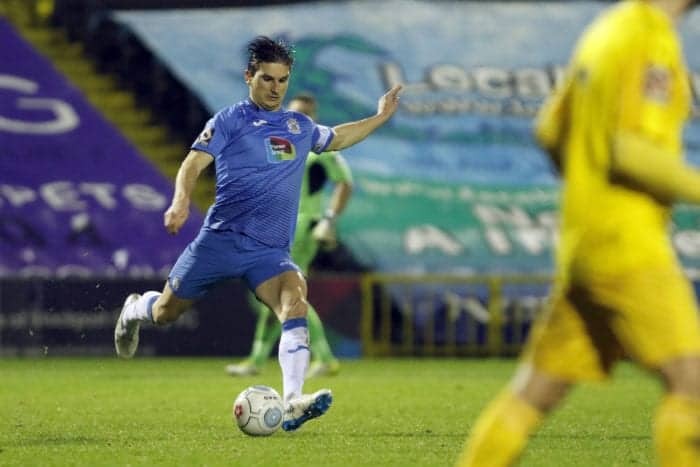 The second half initially saw less action in either final third than the first had done – and, in the course of the more prevalent midfield battles, popular ex-Hatter Gary Stopforth picked up a yellow card following his foul on Jordan Keane. But Hinchliffe was soon to be tested, and on three occasions within eight minutes – as County’s Number One first tipped around the right post a shot by Dudley from the edge of the box, then saved Asante’s diving header from a Simon Grand cross on the left, and finally scrambled to smother the ball on the line after Dawson, beyond the far upright, had headed on Craig Mahon’s delivery from the same flank. Nyal Bell was brought on against his former club, and unleashed through a sea of defenders a low shot that Shenton gathered. And Duxbury rushed to meet a Sam Minihan cross from the right, but headed over, before Bell and Minihan both had efforts blocked in added time. FULL-TIME: County 1 (Walker (penalty), 45), Chester 1 (Asante, 32). Team: Hinchliffe, Minihan, Duxbury, Keane, Palmer (Capt. ), Stott, Thomas (Cowan, 85), Walker, Mulhern (Bell, 67), Osborne (Stephenson, 46), Warburton. Man of the Match: Hinchliffe.